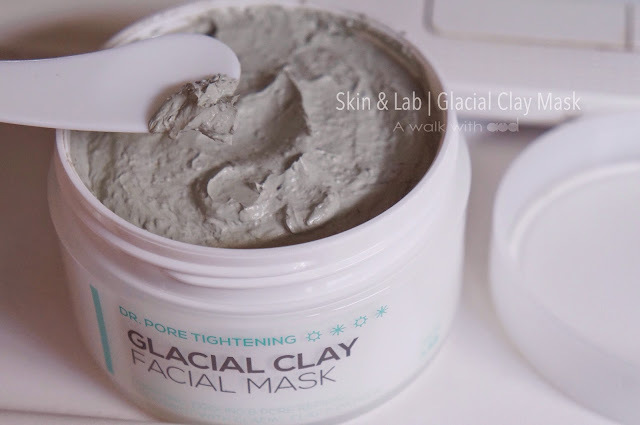 Today, I'm gonna share with you a mask that I've been using recently- Dr Pore Tightening Glacial Clay Facial Mask by Skin & Lab. 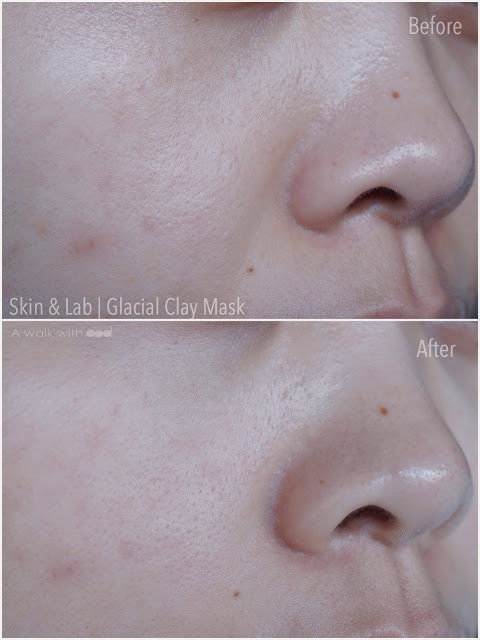 It is a product from Korea which is well known for pores tightening and remove excess sebum secretion. 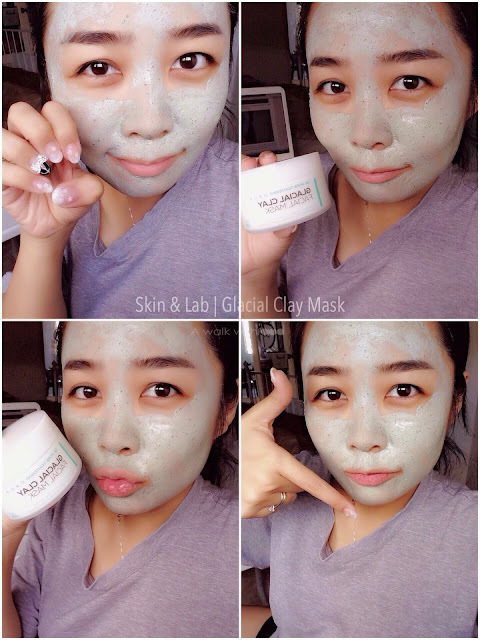 I was blessed with nice people around me, this clay mask was given by Natta Cosme for me to try. I am normally quite lazy with tube/ tub mask because it requires you to put it on evenly but surprisingly I used this more often (at least once a week) then I thought I would. I believe its the effectiveness of the mask, hence I couldn't help myself. Ha! 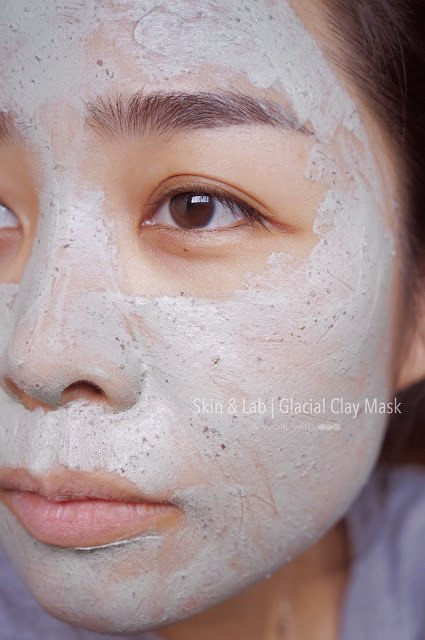 Glacial clay mask is moist type clay facial mask. It is proven to purify the skin both in and out, as well as minimizes the enlarged pores and firms the sagging pore walls. 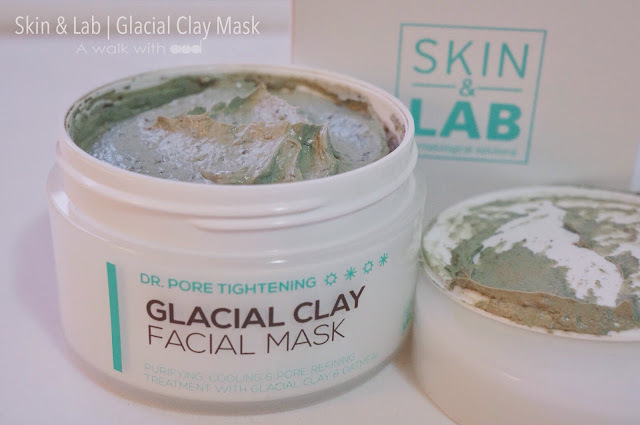 It contains 3000 mg Deep Glacial Soils from Canada (removes accumulated impurities deep in pores, sebum control, acne resolving, calming), Oatmeal (skin softening, eliminating surface, keep your skin moist), and also Tea Tree Leaf (Acne prevention, Acne resolving, Calming). 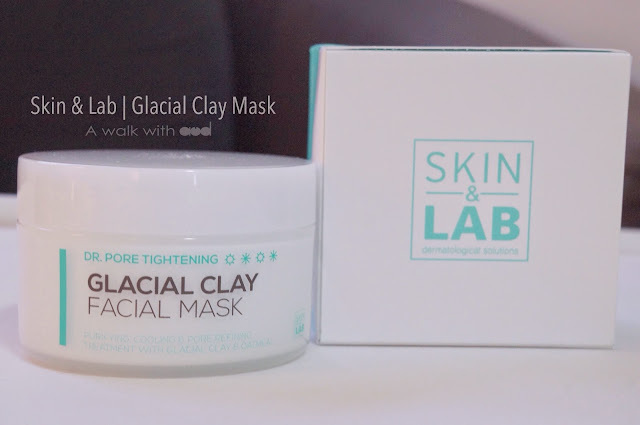 Skin & Lab special 3Cs Pore Care System comes in Clear, Contract and Care. Step 1: Clear- prepare for pores deep cleansing. Eliminates excess sebum, dead skin cell and other skin debris. Step 2: Contract- recover pore-tightening. Contract existing open pores and firm up pore walls to recover healthy structure. Step 3: Care- Rejuvenate, nourish and protects. Hydrates and deliver anti-bacterial activators deep into skin to protect the skin for an effortlessly flawless look. I like that it comes with a spatula as it is more hygiene and less messy. 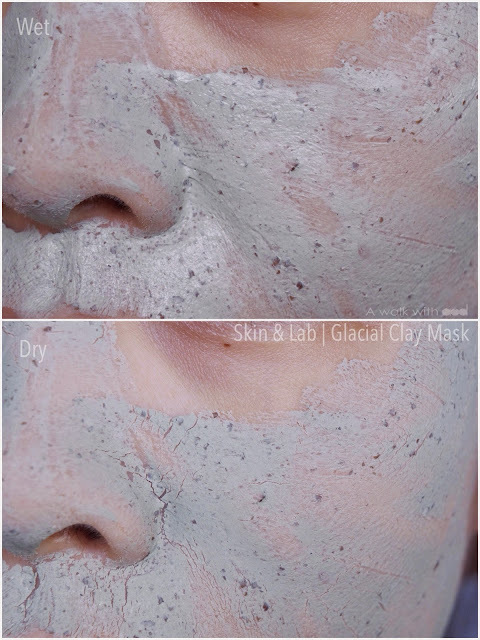 Plus the mask is really smooth so it's easy to spread evenly on face with spatula. 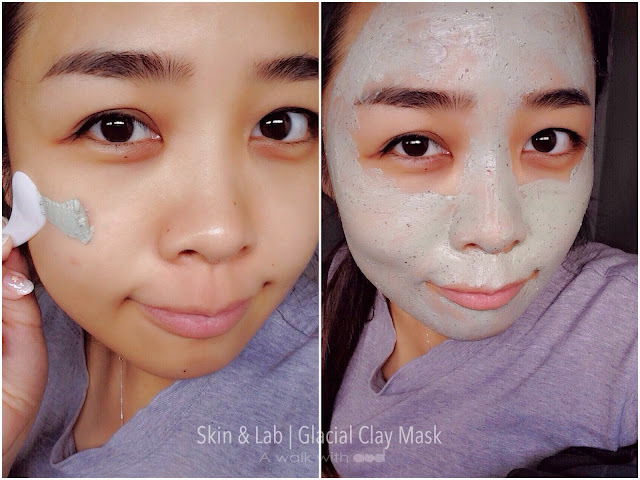 Apply sufficient amount of the clay mask over your face after toning. Remember to avoid eye areas. Also not forget to close the lid after apply or it will dry up. The mask doesn't has any artificial fragrance, it smells sorta like herbs. Leave it on for 10-15 minutes to dry. 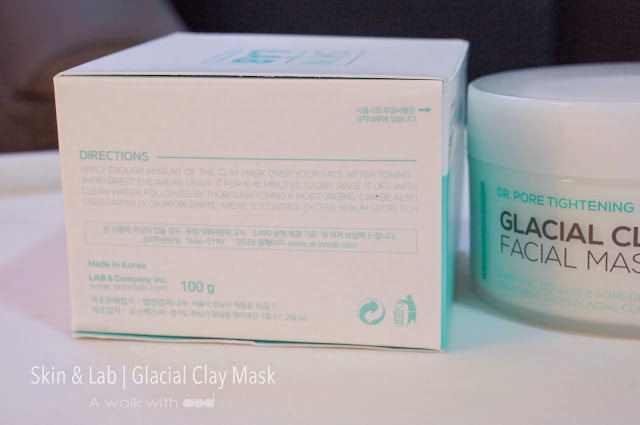 You might feel a slight tingling sensation at the beginning because the mask activates it's pore cleansing effect but it will be gone after a while. To enjoy better contraction and calming effect, you can store the mask cool in fridge. When it's dried, you will feel your whole face is tighten. Rinse it off with clean water followed by toning and moisturizing. Let's see the result after one use. The redness of my acne scar seems to have subsided. Laugh lines are less obvious too! 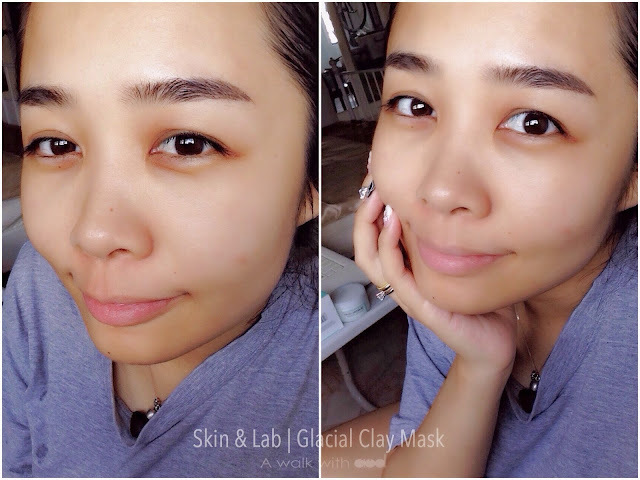 My skin feels smooth and hydrated after pampering myself with the mask. Oh, another good thing of this mask is that it can be used partially on problematic areas to control excess sebum secretion. It comes in 100 ml which can last you for quite a long time! 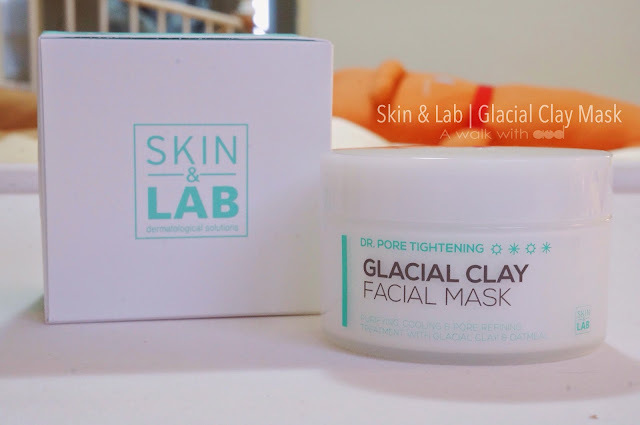 SKIN&LAB Dr Pore Tightening Glacial Clay Facial Mask can be found on Natta Cosme >>here<< at RM 71!